Thick and Creamy Hot Chocolate – Thick, creamy, dreamy hot chocolate made with only 5 simple ingredients, one being your favourite chocolate! It’s Valentine’s Day tomorrow! So you have plenty of dessert recipes sorted for Valentine’s Day, like my Red Velvet Roulade and Frosted Funfetti Cookies, but do you have a recipe for a morning cup of thick and creamy hot chocolate to indulge in? 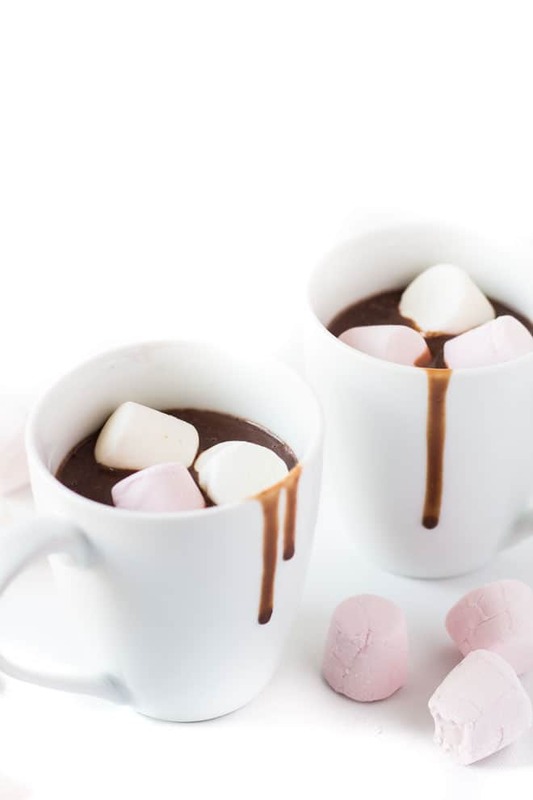 What better way to wake up on Valentine’s Day to a cup of this delicious thick and creamy hot chocolate… Mmmm. 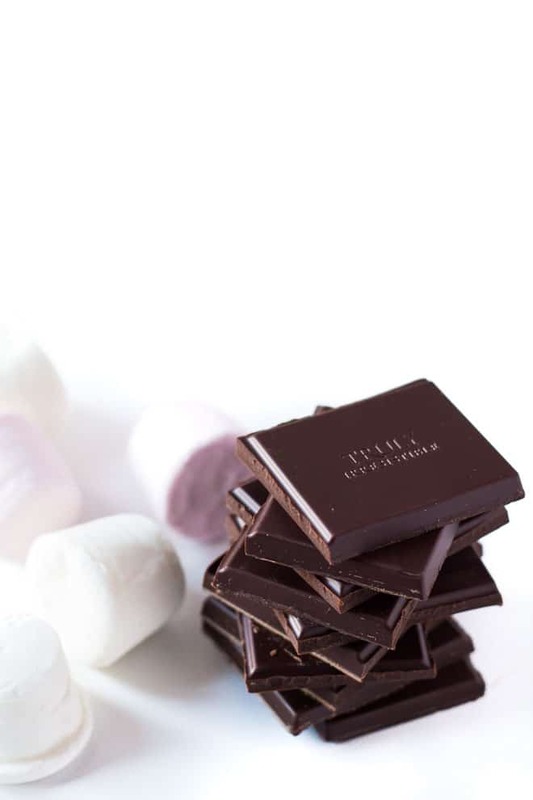 Only requires 5 simple ingredients, one being your favourite chocolate. Only takes 10 – 20 minutes of your time. It tastes so good, you’ll never buy store-bought hot chocolate again. Yup. It is that good. 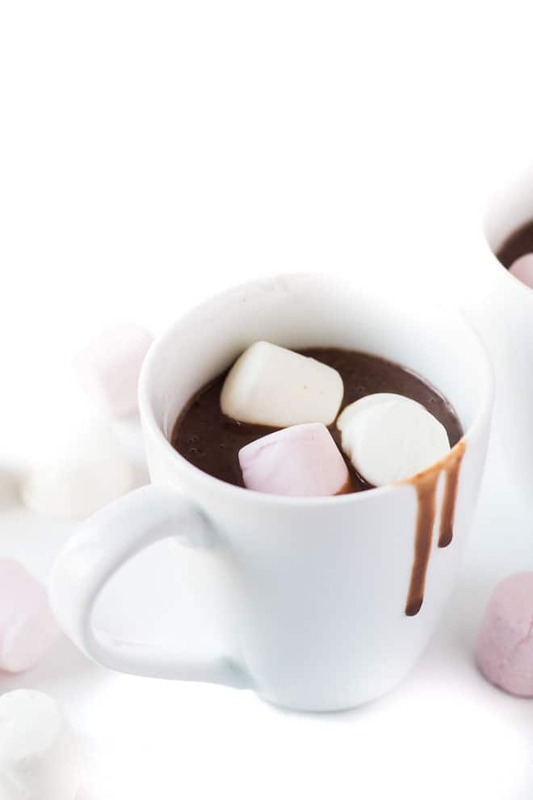 Such a simple recipe that will create your favourite hot chocolate! You can use any chocolate you like! Get creative and use fruit flavoured chocolate. Here, I used a dark chocolate infused with orange oil. Perfection. This recipe serves 2 people, making it perfect for sharing with your loved one on Valentine’s Day. Feel free to double, or even triple the recipe to serve more! Thick, creamy, dreamy hot chocolate made with only 5 simple ingredients, one being your favourite chocolate! In a saucepan over medium heat, bring the milk to the boil. Add the chocolate, vanilla extract, sugar, and cornflour, and whisk until melted and smooth. Continue whisking (making sure to get in the corners of the pan to prevent the chocolate gathering there) until the mixture reaches your desired thickness. 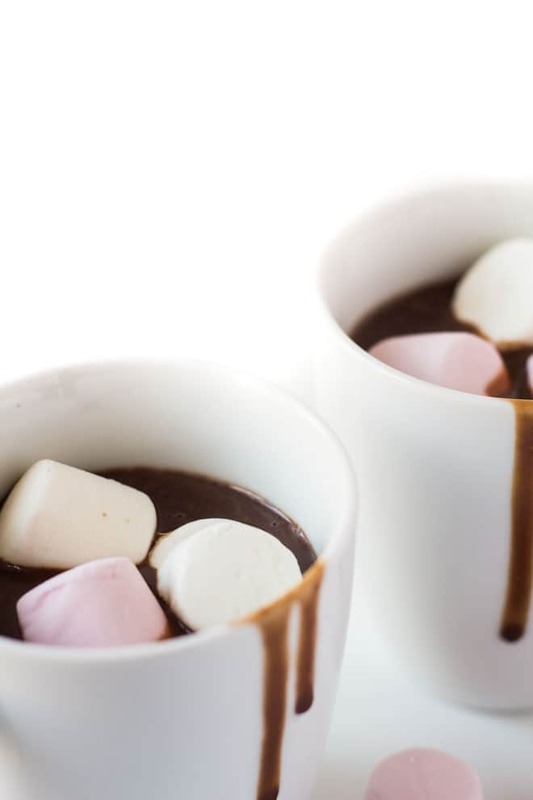 Remove from the heat, and pour the hot chocolate into your favourite mugs. 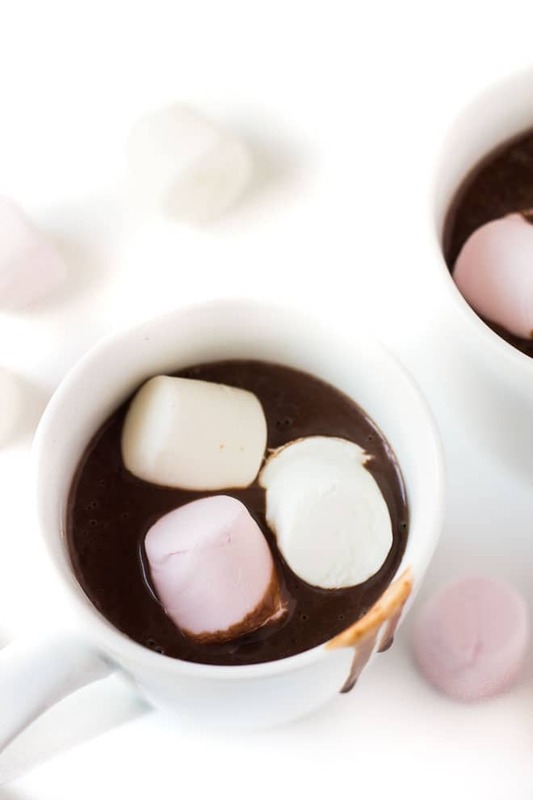 Top with marshmallows, whipped cream, or grated chocolate. Thanks, Farhana! I hope you enjoy! Perfect for the winter Marsha! Actually I wish I can have some right now, today suppose to be a very cold day. Ok! am off to make some hot chocolate because that is sooo tempting ! 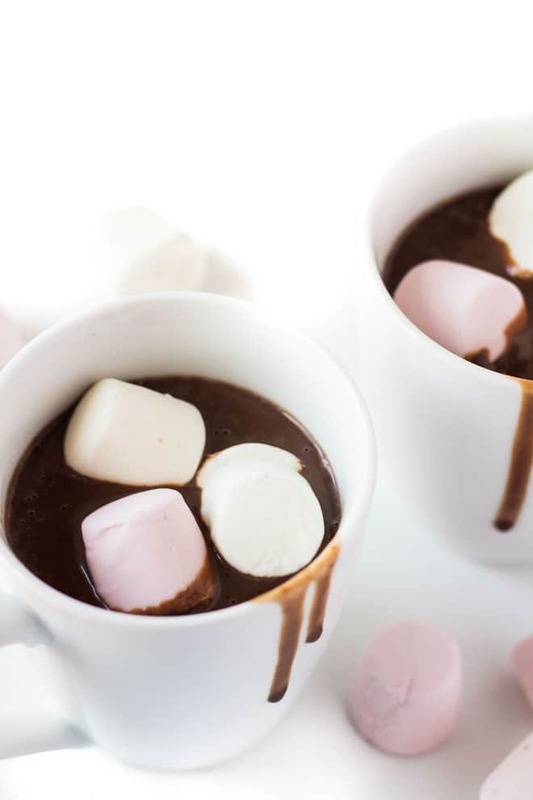 The hubster has been craving hot chocolate like it’s crack (the non wack kind) recently, so I can’t wait to make him this, Marsha! LOVE that it’s super easy, seriously creamy and only 5 ingredients! Winning all around! Cheers, doll! Yum you’re just missing those cute heart-shaped marshmallows, but who am I kidding? This still looks yums! Lvoe these white on white photos. 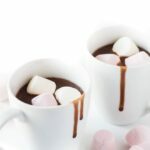 And this hot chocolate looks absolutely divine, Marsha! YUMMY! There’s nothing like hot chocolate on a cold, rainy night.